Learning how to eat with chopsticks is not as difficult as it appears, and like all things in life, practice makes perfect! Follow the simple steps down below and practice regularly, soon you will also be eating like a pro. Chinese food is often prepared and served in small bite-size pieces, which makes it easy when eating with chopsticks. 1) Hold chopstick number 1 between your ring and middle fingers, this chopstick stays stationary, it does not move. Your thumb should help keep it in place. 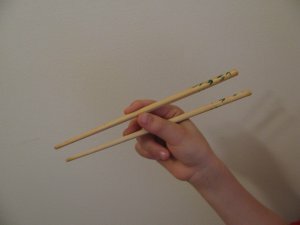 2) Chopstick number 2 slides between your thumb and index finger. 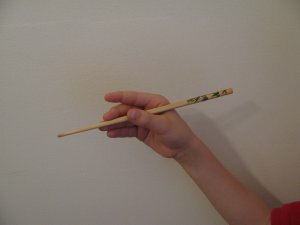 You move this chopstick by moving the index finger up and down, this motion will open and close the chopsticks, which is how you will pick up food. 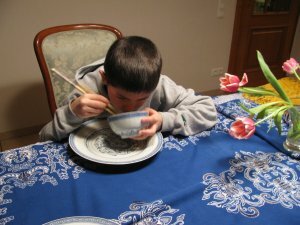 Rice on the other hand is eaten directly from the bowl, which you lift to your lips and with your chopsticks you scoop the rice into your mouth. As you practice, you will develop your "own" technique, and find out what works better for you. There is no right or wrong way really, (my dad might disagree with this statement), but as with holding a pencil, many people do it differently and the goal is to write, with chopsticks, the goal is to get food in your mouth. DO NOT cross you chopsticks, in China this is a symbol of death. When laying on the table, normally on the chopstick stand, they should lay parallel to each other. DO NOT stab your food with the chopsticks to pick it up, this is really bad manners. DO NOT point at people with your chopsticks, this is considered rude. DO use your chopsticks to cut up pieces into smaller bites. Since you dont have a knife, using your chopsticks to cut up the larger pieces is acceptable. You do that by squeezing the larger piece between the two chopsticks and splitting it in two. DO use wood or bamboo chopsticks to learn, they are much easier than plastic or metal chopsticks as these last two kinds are too slick and it makes it harder to get a good grip on the food. Learn here how a Chinese Meal is served. Where do Chopsticks come from? Confucius believed that knives which were associated with acts of aggression did not belong at the dinner table. One of the many superstitions during Chinese New Year is that food must be prepared ahead of time and ALL knives put away, otherwise it is believed that the good luck for the new year will be cut away if a knife is used during the first days of the year. 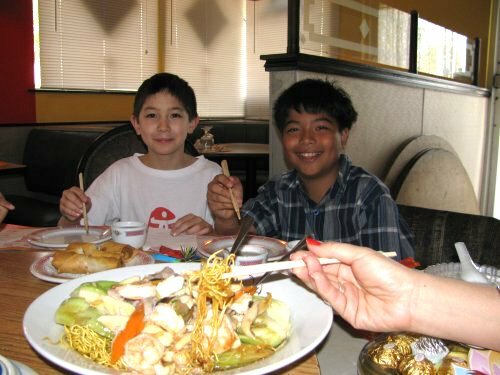 Whatever their origins, the use of chopsticks eventually spread out to other Asian countries as well. Chopsticks are the eating utensil of choice in the East, I.e. Japan and Korea. 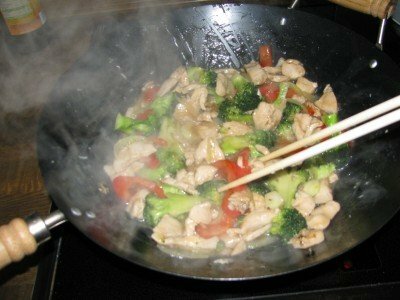 Besides their use at the dinner table, chopsticks can also be used in the kitchen to beat eggs for example, stir and break up noodles, or the longer chopsticks can be used to stir fry or sautéed food, they are quite handy when used as thongs. Here's more on Chinese Cooking Utensils.